(above) The chapel of Saint Boniface, The chapels of the seven tongues, New York, New York. 2013; (left) Saint Michael the archangel, Eleanor Mellon. 1963. (below) Yggdrasil: the world ash, Oluf Olufsen Bagge, 1847. And it came to pass ... when I was 42 years and 7 months old, that the heavens were opened and a blinding light of exceptional brilliance flowed through my entire brain. And so it kindled my whole heart and breast like a flame, not burning but warming. . . and suddenly I understood the meaning of expositions of the books. Henry Vaughan, noted designer of the Washington Cathedral, designed three chapels at the Cathedral of Saint John the Divine: Saint Boniface (1916), along with Saint Ansgar (1918) and Saint James (1916). His architectural style and detailing is a fusion of fourteenth century English and thirteenth century French. The stained glass windows are by Kempe, a British glass-maker, who also designed the windows in the Chapel of Saint Ansgar. Their focus of these works is British saints and missionaries. One of the most striking additions to this chapel is a twentieth century bronze statue of Saint Michael the archangel (1963), made and donated by American sculptor Eleanor Mary Mellon. 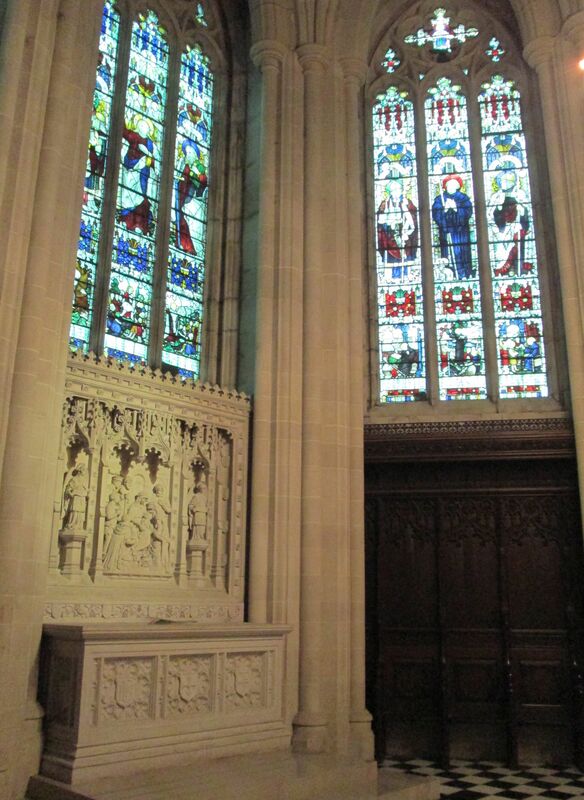 This chapel is dedicated to people of German descent and bears the name of "The Apostle of the Germans", or St. Boniface, who was born Winfrid in the area near Devon, England during the 7th century. There is much material available on Boniface, including several vitae, a few sermons, numerous legal documents as well as his personal correspondence. He served primarily as a missionary to the Frankish Empire and is the patron saint of Germany as well as tailors, brewers and file-cutters. Symbols associated with this saint include the oak, axe, book, fox, scourge, fountain, raven and the sword. His feast day is June 5. Saint Boniface and the felling of Jupiter's oak (also known as Donar's oak, Thor's oak, and Jove's oak) is a legend from the Vita Bonifatii auctore Willibald. Germans worshipped groves and trees as part of their rich nature-based mythology. 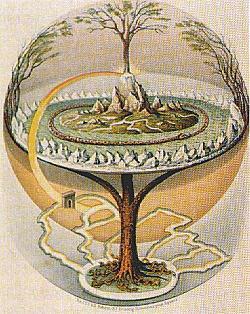 This tradition links back to the sacred world tree, Yggdrasil, found in Norse mythology. During the spread of western Christianity, missionaries targeted these trees for destruction. According to legend, Saint Boniface struck the oak of Jupiter with an ax. A strong wind then felled the tree to the ground, even though Saint Boniface had only managed to create a notch in the tree's trunk. German villagers who watched the tree fall expected Boniface to be struck dead by their gods. When that did not happen, all of the spectators converted to Christianity and they then used the wood from the oak of Jupiter to build a chapel dedicated to Saint Peter.